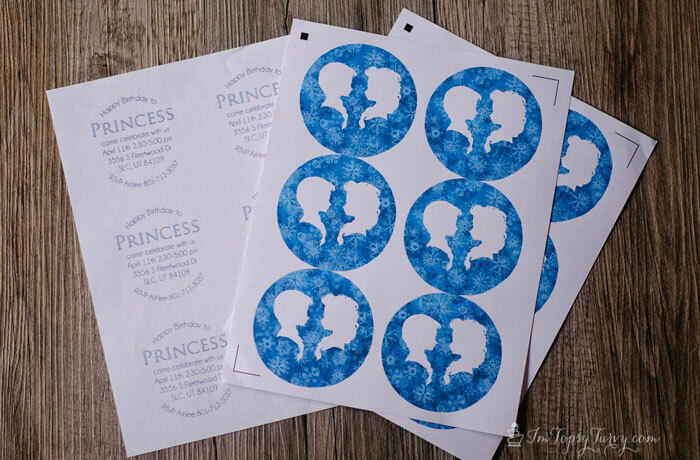 I’m so excited to share Princess’s Frozen birthday party this week with you guys! I hope you enjoy seeing it as much as I enjoyed planning it! I love planning birthday parties for my kids, they are so much FUN! Frozen was an easy theme for Princess to choose this year. The hard part was narrowing down all the options! So the first part, Invitations, they are the first view guests get of the theme, of what to expect from the party. I love doing hand made, creative, invitations! 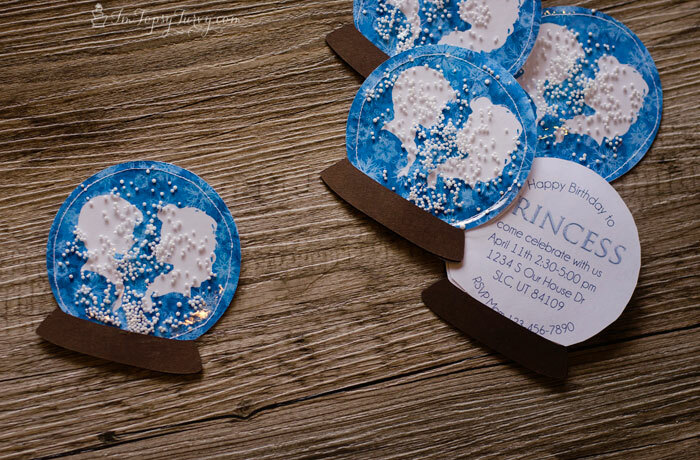 I decided to create Snow Globes for the invitations! The information on the back and the front something from the movie. I created layers of blue snowflakes (dark to light) in photoshop then I created silhouettes of Anna and Elsa and laid them over the top! 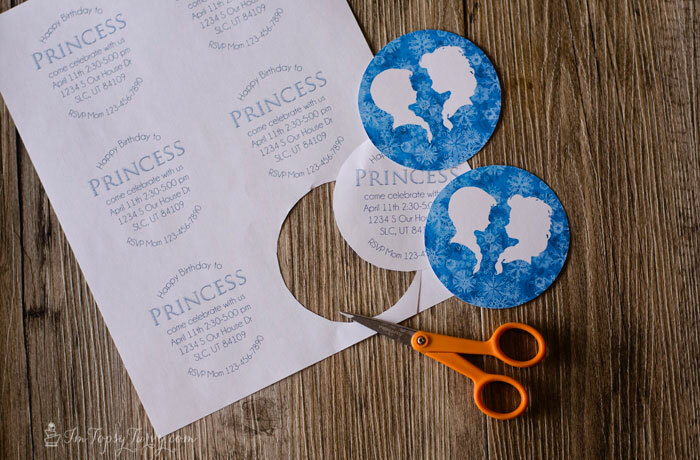 Then I bought some thick plastic sheeting and cut out matching circles, one for each invitation. For the “snow” I wanted mini styrofoam balls, but I didn’t want to buy a 50 lbs bag, so instead I bought a travel pillow and cut it open! 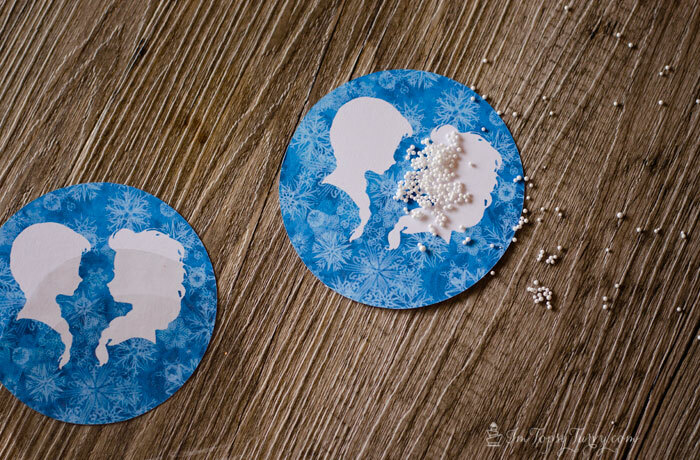 It created a HUGE mess, they stick to everything… ANYWAY, I poured a little bit into each invitation, topped with a plastic circle then used my sewing machine to sew around the circle! 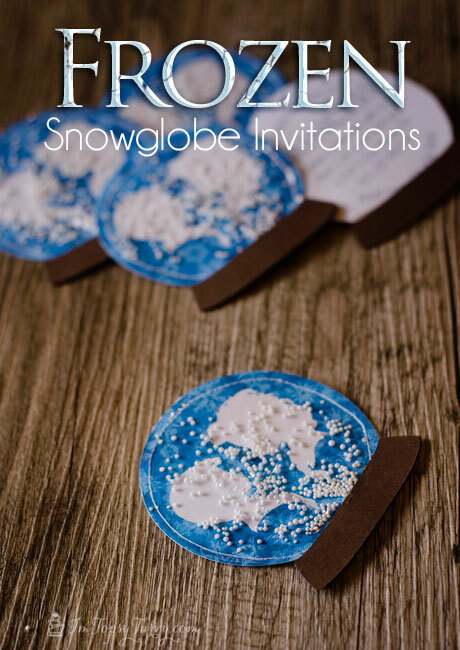 Then I glued brown curves to the front and back of each invitation to look like the base of a snow globe! I love love LOVE how they turned out!!! They went through the mail just fine too! Always a plus! Thanks so much!!! I love coming up with new invitation ideas! Oh my goodness – what a really fun idea! Very creative! Pinning. Thanks so much!!! 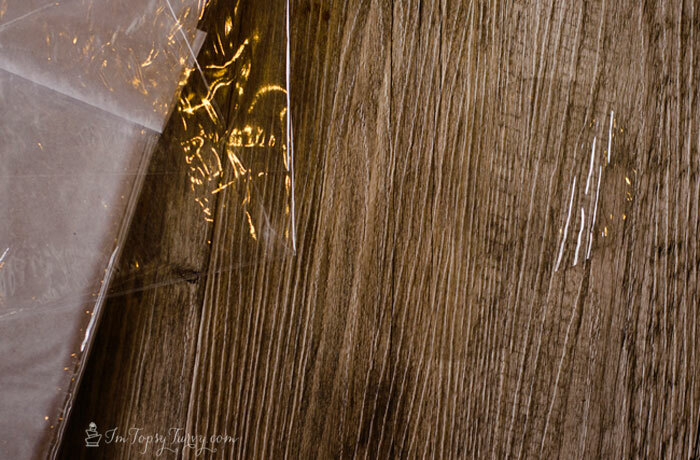 Coming up with the best invitation is always so much fun, and sets the mood for the whole event! So cute!! I love the way the invitations came out! I am SO happy with them and I’m glad everyone else likes them too! These are so darling. What a creative idea. Thanks Vanessa! Not much I love more than fun parties! Thank you so much! I think this technique would work for quite a few fun parties!